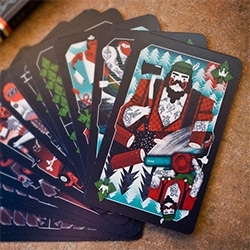 Limited Edition Incredible Men Playing Cards, beautifully designed set of playing cards from Prague based Tomski & Polanski. 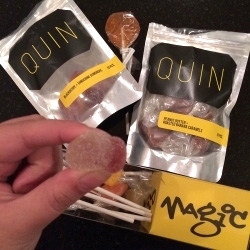 FEATUREDQuin Candy in Portland, OR - fun packaging, store, and delicious small batch, handmade gum drops, lollipops, caramels, + marshmallows in unexpected flavors like Blackberry Tangerine, Peanut Butter Roasted Banana and more! 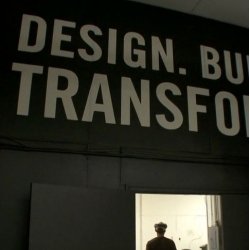 Inside Nike CEO Office : Mark Parker. 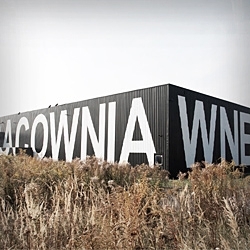 Pracownia Wnętrz (Interior Workshop) in Krakow, Poland is a 1200 m2 retail space arranged using low-cost raw materials such as scaffolding, banner mesh and OSB boards. 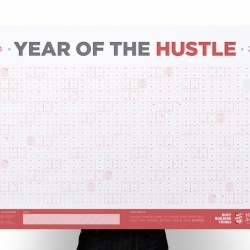 "Free is not for nothing. 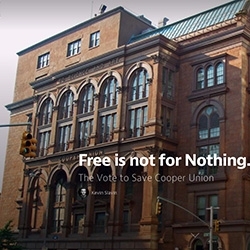 The vote to save Cooper Union." 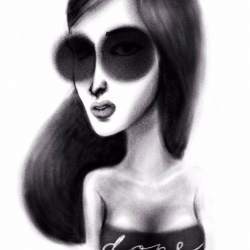 Good read by Kevin Slavin about the importance and true meaning of free. Walking on Water Experiment - People run, jump and dance on a pool filled with 2,100 gallons of non-newtonian fluid (corn starch and water) in Kuala Lumpur, Malaysia. 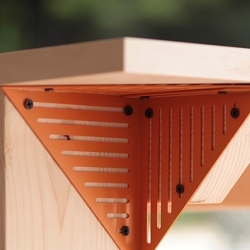 One popular piece from the NOSIGNER’s Open Source line is the “corner module,” a steel plate made to support desks, shelves, and hanging lampshades. 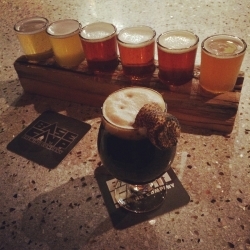 FEATUREDBase Camp Brewing in Portland, OR ~ from their fun graphic design/branding, aluminum bottles, and toasted marshmallows (torched on to their pint glasses pre-pour)... to a twitter to real life high five. 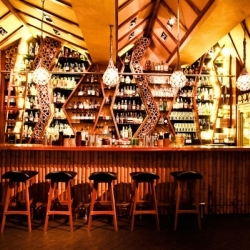 Every day is a Polynesian holiday in Honi Honi, Hong Kong’s first Tiki bar. 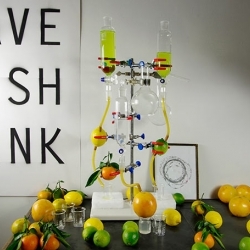 Running Through by François Xavier Saint Georges - ice cold vodka running through lemon, pure shot of citric good. 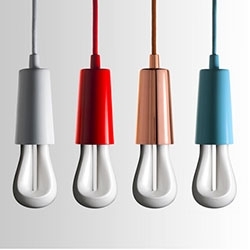 The Plumen 002 is their newest design and is a 7W bulb that is created from one bent tube. 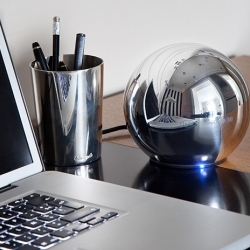 It generates a similar amount of light as a conventional 30W bulb. 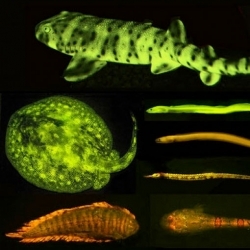 Researchers have identified more than 180 species of fish that sport fluorescent coatings. 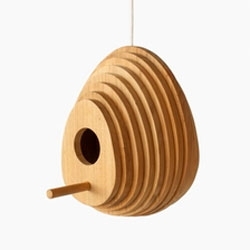 Tree Ring Birdhouse, designed by Jarrod Lim for Hinika. 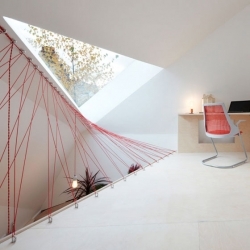 Fraher Studio's beautiful office, The Green Studio. 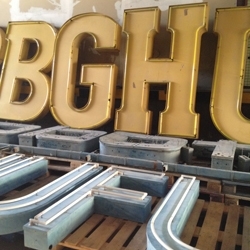 VIDEO IF YOU BUILD IT, a documentary following Emily Pilloton and Matthew Miller to rural Bertie County, North Carolina, where they work with local high school students to help transform both their community and their lives. 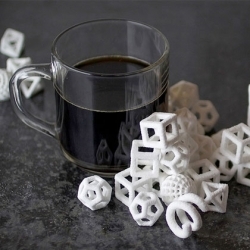 The ChefJet 3D printer, which produces edible prints in chocolate, vanilla, mint, sour apple, cherry, and watermelon flavors. 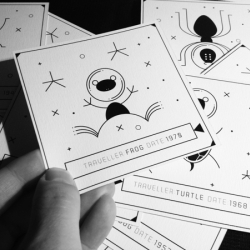 Spiffing design project from Hungarian graphic designer, Norbert Mayer, called Animal Space Travellers celebrating the different species to have space travelled. 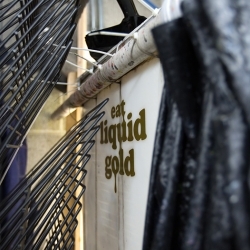 A new Anglepoise Installation at The University of Portsmouth, UK. 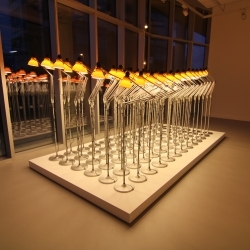 78 Lamps installed by students. 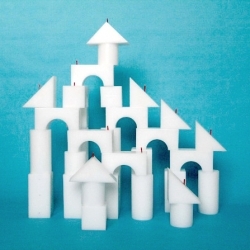 Lovely stackable Candle Castle from Tom Gottelier. 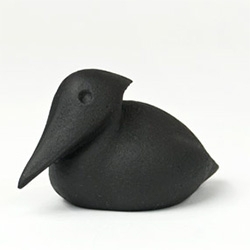 Let's you build your own candle fortress and set it ablaze! 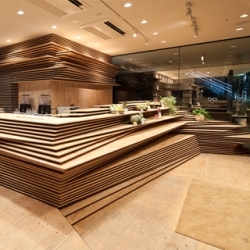 Stacked wooden boards define the interior landscape of Osaka’s new Shun*Shoku Lounge designed by Kengo Kuma and Associates. 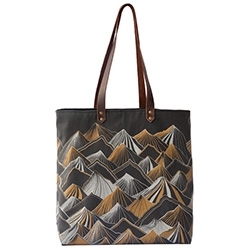 If you Love typography, this is the place for you! 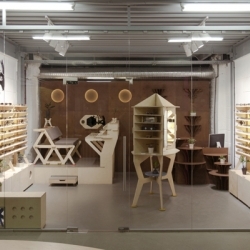 An entire museum dedicated to your passion: Buchstaben Museum - Berlin. 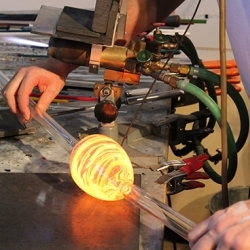 A look inside the studio of glass artist Jim Loewer. 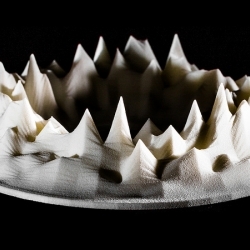 A designer called Lukasz Karluk come up with HoloDecks, a project focused on transforming sound through 3D printed sculptures. 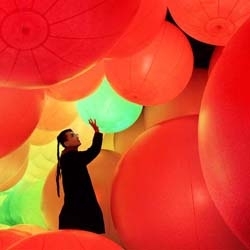 teamLab's interactive installation "Homogenizing and Transforming World" currently at Hong Kong Arts Centre with giant floating balls that react to touch. 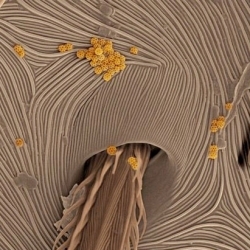 Mysteries of the Unseen World, using high-speed and time-lapse photography, electron microscopy, and nanotechnology to show us the world that exists all around us, yet out of sight. 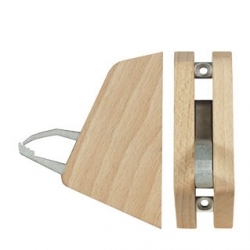 The Clever Hook from Linden Sweden that holds and grabs your stuff. 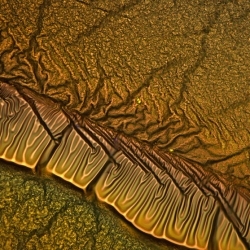 Ingrid Graz’s SEM photographs of amorphous carbon deposited on glass. 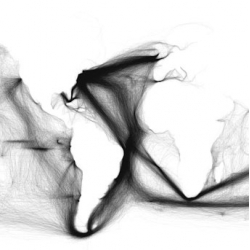 Beautiful visualisations of all of the voyages from the ICOADS US Maury collection. 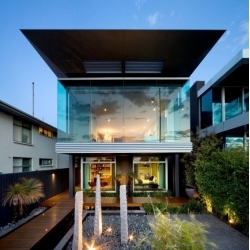 Finnis Architects's Esplanade House in Brighton, Melbourne. 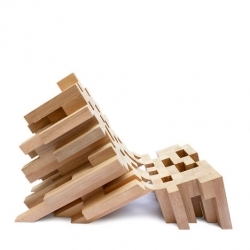 The Butake Chair by Raúl Téllez Herrera is a modern take on the Butaque. 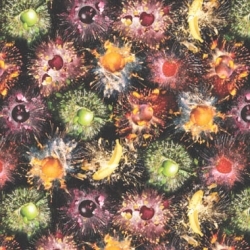 Bompas & Parr's flavoured Multisensory Fireworks for New Years Eve, complete with Peach Snow, Orange Bubbles, Banana Confetti and Strawberry Clouds. 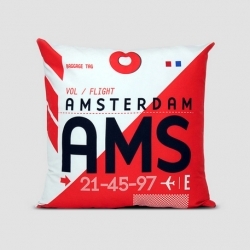 Pillows inspired by the airports IATA codes. 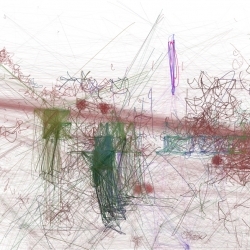 Computers Watching Movies shows what a computational system sees when it watches the same films we do. 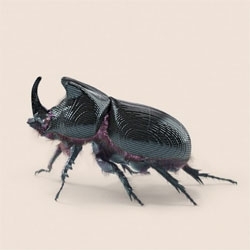 Vincent Fournier's Post Natural History explores the ideas of technologically enhanced wildlife, like a GPS tracking rhinoceros beetle and robotic jellyfish drone for transporting freshwater. 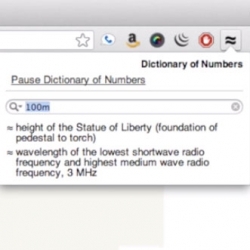 Google's Dictionary of Numbers helps make seemingly abstract numbers more tangible. 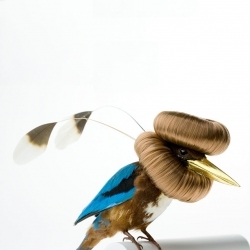 New Zealand's Kar­ley Feaver gives taxidermy mounted birds even more bizarre hairstyles. 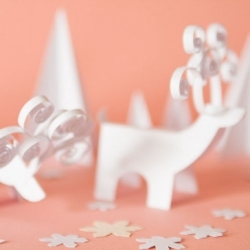 Making of re:blog's Christmas message. 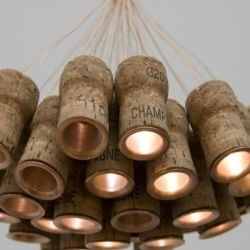 Amazing Chandelier made from recycled Champagne corks...if you have kept some from New-Year party, you know what to do with them now ! 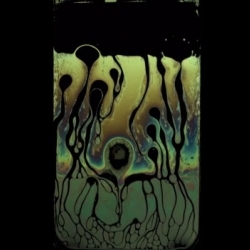 VIDEOA slow motion video captures the collapse of a soap bubble in contact with a cold rod. 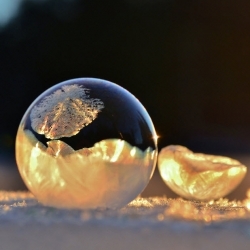 Angela Kelly's beautiful photographs of frozen soap bubbles.